Edwin Arlington Robinson is America’s poet laureate of unhappiness. In patiently crafted verse of great sonority, he portrays men and women suffering from life’s ordeals yet striving to understand and master their fates. Robinson’s tragic vision had its roots in a youth spent in the small town of Gardiner, Maine. So sensitive he claimed he came into the world “with his skin inside out,” he once told a fellow poet that at six he had sat in a rocking chair and wondered why he’d been born. Robinson's early difficulties led many of his poems to have a dark pessimism and his stories to deal with "an American dream gone awry". His brother Dean died of a drug overdose. His other brother, Herman, a handsome and charismatic man, married the woman Edwin himself loved (Emma Löehen Shepherd), but Herman suffered business failures, became an alcoholic, and ended up estranged from his wife and children, dying impoverished in a charity hospital in 1901. Robinson's poem "Richard Cory" was thought by Emma (Herman's wife) to refer to this brother, her husband. He won the Pulitzer Prize three times in the 1920s. 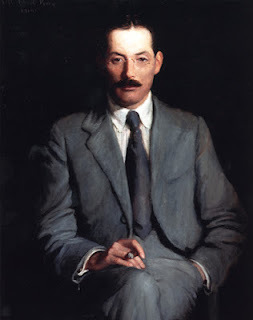 During the last twenty years of his life he became a regular summer resident at the MacDowell Colony in New Hampshire, where several women made him the object of their devoted attention, but he maintained a solitary life and never married. Robinson died of cancer on April 6, 1935 in the New York Hospital (now New York Cornell Hospital) in New York City.